Thousands of fungi-loving adults and children crowded the Louden Nelson Community Center this past weekend to get their fill of everything fungus at the 45th annual Fungus Fair. The clusters of people flocking to booths, smell of fungi permeating the entirety of the venue and countless specimens of all sorts of fungi make the fair a well-known and unique part of the Santa Cruz community. The Santa Cruz Fungus Fair is organized by the Fungus Federation of Santa Cruz (FFSC), an organization dedicated to studying Santa Cruz county’s local fungi since the 1970s. 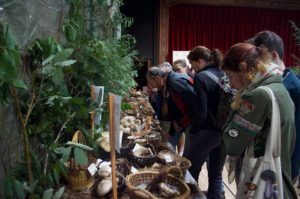 This year’s fair focused on mushrooms as medicine, teaching people how they can use different types of fungi as medicinal alternatives to pharmaceuticals. The Louden Nelson Community Center buzzed with activity as people of all backgrounds explored and learned about the abundance of fungi in Santa Cruz and the surrounding areas. Photos by Lluvia Moreno. First-time vendor Anna Towers showcased her fungi photography booth this weekend, and discussed how she only gained appreciation for fungi aesthetics when she started her business. “I never thought I could ever be excited by something as mundane as mushrooms, but now they’re the most interesting thing I can talk about,” Towers said. Local mycologists held lectures on the physical and mental health benefits of mushrooms and informed attendees of how to spot poisonous mushrooms. Other lectures, titled “Hallucinogens as Entheogens” and “Herbal Spirit Medicine,” emphasized the benefits psilocybin mushrooms can have on spiritual well-being. The event featured hundreds of mushroom varieties, ranging from edible fungi to toxic specimens. FFSC spokesperson and local fungi scientist Douglas Smith noted this year’s event drew around 8,000 attendees, one of the largest in the Fungus Fair’s history. The fair’s vendor booths filled up three large rooms. Upon walking into any of these rooms, one was met with smiles and obvious intrigue of the booths. Participants were clearly drawn to the varied fungi on display. The booths sold everything from mushroom lasagna to fungi-growing kits. Booths like Peggy and Anna Towers’ “Friendly Fungus Photography” drew visitors interested in their vibrant mushroom photographs from all over the Bay Area. The mother-daughter duo showcased their photography business at the fair for the first time this year. Both were thrilled by the attention their booth got. While some attendees were well-informed and involved with the FFSC, others were first-time guests, curious about the event. 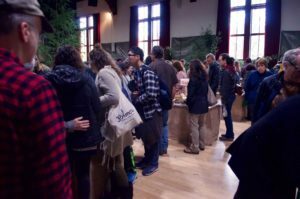 Most people in attendance regarded the Fungus Fair as something that stands out as a unique part of the Santa Cruz community, bringing people together to appreciate fungi. Even after almost half a century, this event continues to grow. Douglas Smith and the rest of the FFSC hope the fair will bring about more attention and interest in studying Santa Cruz’s local fungi species.